Tired of running your fiefdom through political marriage and the occasional spot of war? Why not summon the dark forces of Satan to help you out. 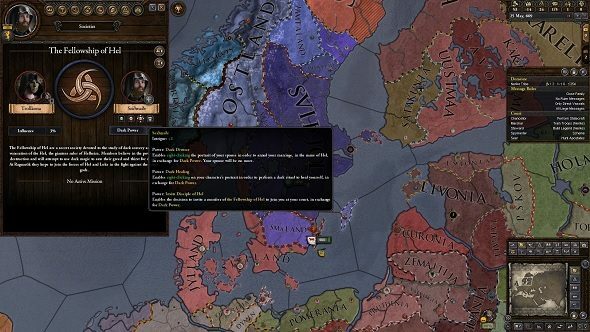 Paradox Interactive have just released the Monks and Mystics expansion for Crusader Kings 2, which greatly expands the religious aspects of the medieval grand strategy. If you are yearning for more grand strategy, here are some more PC 4X games. While controlling bishops and entreating with the Pope did factor in when playing previous versions of Crusader Kings 2, the Monks and Mystics expansion allows members of your court to ascend through the ranks of religious society, encountering new events and earning new powers along the way. They can choose to keep holy orders, by practicing charity, building churches and doing good works. Holy men and women can also worship the forces of darkness in secret, dealing with the Devil and smiting your enemies with malevolent magics. Devil worship comes with a host of new demonic powers, including the ability to possess people or getting a marriage annulled through the use of dark hexes. You can even sacrifice prisoners to the Prince of Darkness, strengthening your bond with the Devil but having long standing repercussions on your soul. Speaking of clandestine nastiness, Monks and Mystics also allows players to join a secret order of sacred assassins, who will eliminate anyone who dare undermine the faith. If you ally with these hermetic hitmen, you can set up your own secret Inquisition who can take care of any undesirable elements at court. As for more righteous endeavours, players can now accrue holy relics, special weapons and ornate jewellery to keep in your treasury. These treasures can give you additional bonuses, or can be used as bargaining chips to help sweeten a deal. If you’re looking to gain favour with a bishop in the next province over, maybe send him that splinter of the True Cross you picked up on that trip to the Holy Land. If you’re ready to take holy orders, the Monks and Mystics expansion is now available on Steam and on the Paradox Store for $14.99/£10.99. To really get you in the monastic mood, you can also buy the special Hymns of Revelation music pack, which gives you five hymns to chant along to, while you are sacrificing your cousin’s child to Satan.